What is the gospel? 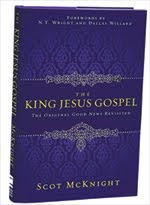 That is the question Scot McKnight asks and answers in his new book The King Jesus Gospel (Zondervan, 2011). McKnight’s main point in the book is that gospel is about more than salvation. The gospel, he argues, is how Jesus completes the story of Israel. McKnight has written this book because of his contacts with students, pastors and other believers over the years. His concern is that, at least within evangelical circles, the gospel has been boiled down to a message of salvation, a rescue plan from sin and hell. For many, the gospel is about a decision. McKnight demonstrates this tendency by providing anecdotal stories from his students and others. For some, the whole gospel is wrapped up in the death of Jesus, and the purpose/need of the resurrection is not clear. Their entire encounter with “gospel” has been about a decision to get them “in” and little more. But McKnight contends that in order to understand the story of Jesus and by extension the purpose of the cross and the resurrection, you must place it within the story of Israel. You have to start at Adam and Eve, Abraham and work through the Old Testament to the story of Jesus (p. 36). For McKnight, “gospel” explains how the story of Israel finds resolution in Jesus and the kingdom of God. The so-called “plan of salvation” is not the gospel, rather it emerges from the story of Israel and the story of Jesus (p. 39). But in the current culture, the plan of salvation and the method of persuasion have crushed the story of Israel and Jesus to the point that it is all about salvation, and often little else (p. 43). McKnight spends the rest of the time unpacking Paul, the gospels and Acts to demonstrate his point about the gospel. For McKnight the “gospel” of Paul is found in 1 Corinthians 15:1-5; 20-28. In these verses we learn that the gospel is defined as Christ’s death, burial, resurrection and appearance (p. 49). But it is also connected to Israel because all of this definition is balanced on Paul’s claim that it happened “according to scriptures” (p. 50). McKnight argues that the story of Jesus is not just about Good Friday, but rather a complete story which encompasses the entire plan of salvation. And although the cross and salvation are central to the story, they are not the story (p. 53). Thus in 1 Cor 15:22 Paul connects the story of Jesus with the story of Adam. And in 15:28 Christ places all things under God, thus completing the story that began with Adam (p. 56). The gospel that is found in 1 Cor 15 begins with creation and completes itself in the consummation when God is all in all (p. 61). After laying the groundwork for his argument of what the gospel “is,” he unpacks the Gospels and Acts. He demonstrates that Jesus as the resolution to the story of Israel is the message that was preached by Jesus and the early church (p. 100; 117-18). Interestingly, sin, while make an appearance, does not receive the same attention in the message as the kingdom of God and Jesus as the king. It is not that sin is not a problem. But it is not the only focus of the story. So how then do we understand the gospel in light of the story? McKnight suggests four things. (1) The gospel is about confessing that Jesus is Messiah and Lord, not that we are sinners and need to find Jesus (p 133). (2) The gospel is not driven by atonement theory, but the story of Israel (p. 134). (3) The gospel does not focus on wrath. There is judgment, but it is not a central theme (p. 135). (4) The gospel is resolving the story of Israel, not problem of sin and salvation (p. 142). (5) The gospel tells the story of Jesus, which is more than just his death on the cross (p. 144-45). McKnight then closes the book with some suggestions for how we can create a gospel culture. The book is less than 200 pages, but there is quite a bit here. And I fear that I may not have done Justice to everything McKnight is trying to unpack. And for some readers there will be a serious learning curve here. But I think he has provided a good corrective to the prevailing, popular view of “gospel.” There will be some (many?) who will suggest that he is going soft on the problem of sin and the necessity of salvation. But those who do will not be hearing him clearly. Those still matters, but sin and salvation have been emphasized to the detriment of the rest of the gospel. What McKnight is trying to do is to get readers to see themselves as part of the ongoing story of Israel and Jesus. And when that happens, hopefully, their outlook will be less individualistic and more corporate, and their understanding of the Kingdom of God more robust. The book is certainly aimed at the evangelical community and I suspect that it will cause a firestorm. But perhaps it will also open up a debate that needs to be had. What do we mean by gospel? Is it only about getting free from hell and sin? Incidentally, some may wonder from reading the book if Scot is suggesting that evangelism is no longer important. On his Jesus Creed blog McKnight has started blogging on that topic, addressing what some may see as a gap in the book. I finished this book last week. I found it stimulating. Evangelical reductionism has tended to be the measure of who's in the club and who's not. This book helps the reader get back to basics...a good thing. I recently heard one pastor state from the pulpit that the only reason for Israel as God's chosen people was to provide a people from whom Jesus could come. He totally missed the relationship of Yahweh with humanity throughout history that, according to McKnight, culminated in Jesus. Actually, this is not a new or drastic reading. In recent years, many have reacted against the truncated gospel of confrontational evangelism (think Four Spiritual Laws and the like) and the radical individualism that accompanies it. Some have called it “Christian humanism.” Others have called it utilitarian religion. In truth, Jesus came to inaugurate a kingdom that will destroy the work of Satan and set creation free. In the aftermath, followers (believing disciples) become the children of God and enjoy the fruits of his victory in the present and in the future. However, the call of evangelism includes the conscription of would-be followers into Christ's army to include assimilation into a local body of faith that lives out the Gospel in word, deed, and sign. The consequence of evangelism requires the new believer to submit to Christ’s lordship so that Christ’s will and Christ’s purposes are accomplished through him or her. Submission assumes repentance and realignment. Literally, a new believer is ripped out of the kingdom of Satan and transported into the kingdom of God. For this reason, biblical evangelism is spiritual warfare. Away with facile “once saved always saved” clichés that give wayward believers a false sense of being right with God while they are living a life that betrays the Gospel. Like they say, you can accept him as your Savior until you have made him your Lord.